Here are the fantasy and science fiction books for children and teenagers that have just been released (taken from Teens Read Too, with help from Amazon). Has anyone read Ring of Fire: Century yet? It looks like it might be a good one for my nine-year old. Sorry there aren't pictures for everyone, but blogger (or my computer) has decided not to let me put them in. 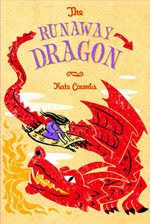 THE RUNAWAY DRAGON by Kate Coombs ( who blogs at Book Aunt). "When Meg’s dragon, Laddy, flies away from home, she knows she must go on a quest to find him. But she hasn’t counted on her parents, the king and queen of Greeve, sending ten guardsmen along. Fortunately, she is also accompanied by her best friends: Dilly, a lady-in-waiting and a cool head in any crisis not involving heights; Cam, a gardener’s assistant who knows the exact value of a brick shed filled with sausages; Nort, a skinny guardsman who has never given much thought to crows; and Lex, a young wizard with bad taste in horses, magic carpets, and sorceresses. Of course, Meg’s quest goes topsy-turvy once she enters the enchanted forest—and her adventure is just beginning. What’s more, meeting up with the dashing bandit Bain again isn’t at all what she expected. Will this princess be able to rescue herself, let alone anybody else? ANDREW NORTH BLOWS UP THE WORLD by Adam SelzerAndrew "Danger" North is no ordinary third-grader. He, his brother, Jack, and his father are spies. That is what Jack has always told him, and everything Andrew has learned from his dad’s favorite spy movies tells him it must be true. When Andrew comes across his brother’s graphing calculator, he’s sure it’s a communication device that will put him in touch with the secret spy headquarters. But instead of punching in a greeting to the spy society, Andrew accidentally punches in a code that might blow up the world! And if that isn’t bad enough, his math teacher then confiscates the top secret communication device and takes it to the mysterious Storage Room B. Now Andrew is on a spy mission to find his brother’s communicator and save the world from mass destruction. EARTH'S MAGIC by Pamela F. Service. The third book in a trilogy. "Heather and Earl (called Merlin the wizard by most) are working with King Arthur to unite Britain following a terrible nuclear devastation. Merlin’s sworn enemy, Morgan LeFay, is also organizing her forces, hoping to take over the world once and for all. Earth’s only hope is for Earl to find his father, who has been trapped in an enchantment for two thousand years. The problem is, Earl doesn’t know where to look, and worse, doesn’t even know what form the enchantment takes. Time is running out and Earl and Heather must solve the ancient mystery and return with the key to the Earth’s Magic. Traveling to one of the origins of humanity, the ancient kingdom of Kush, Merlin must decipher the key before the summer solstice when a great battle will be waged to decide the future of the earth." THE FARFIELD CURSE: BRAN HAMBRIC by Kaleb Nation. "In a bustling metropolis where magic is outlawed, a six-year-old child is found inside a locked bank vault. A scrap of paper reveals his name: Bran Hambric. The child remembers nothing of his life before the vault. Only magic could have done this. But why would any mage risk breaking the law to place a child in a bank vault? Eight years later the City of Dunce has forgotten about Bran. Even his foster parents don't seem to know he exists. But there are those who have been watching, biding their time, waiting to strike, people who know where Bran came from and why he was sent away. And they will do anything to get Bran back, dead or alive…"
HUNTER BROWN AND THE CONSUMING FIRE (Codebearers) by The Miller Brothers. Hunter and his friends travel back to Solandria, led by a mysterious flame on a quest to find the mysterious Seven. They must fight off Xaul, who threatens to steal the flame and destroy the Reistance. (Christian fantasy). THE MAGICIAN'S ELEPHANT by Kate DiCamillo. "...the tale of Peter Augustus Duchene, a ten-year-old orphan who receives an unbelievable piece of information from the local fortuneteller. Peter learns that his fate is tied to an elephant that has inexplicably fallen from the sky when a magician's trick goes terribly wrong. Why did it happen? And, how can an elephant possibly change the course of Peter's life?" PHILIPPA FISHER AND THE DREAM-MAKER'S DAUGHTER by Liz KesslerPhilippa Fisher is trying to have a good time on vacation with her parents, but she’s feeling lonely. When she meets Robyn, a girl with sad eyes and a strict father, she enjoys the company, but can’t help wondering what Robyn and her dad might be hiding. Meanwhile, Daisy, Philippa’s best friend (and fairy godsister), sneaks into her former charge’s room for a visit, but now has a furtive new mission and must dash away. Philippa longs to uncover the reasons behind her friends’ odd behavior, but friendships can be tricky when there are secrets — and unexpected danger — involved! ROLAND WRIGHT: FUTURE KNIGHT by Tony Davis. "Roland Wright wants to be a knight in armor. The problem: Roland’s dad is a blacksmith, and only boys from noble families can even dream of becoming knights. When mysterious visitors arrive in the village one day, everything changes. Roland finds himself in the contest of a lifetime, with a real chance to become a page, the first step on the road to knighthood. But how can skinny, clumsy Roland beat an opponent who is bigger, stronger, and older—and who doesn’t play by the rules?" THE SECRET HISTORY OF MERMAIDS by Ari Berk. "Since ancient times, seafarers and coast-dwellers the world over have reported encounters with merpeople. Variously known as Finfolk, Dinny Mara, Nereids, Blue Men, and Merrymaids, merfolk have been the source of both gifts and disasters for humankind. Now a lavishly illustrated resource offers insight into the lives, origins, language, and magic of these elusive peoples." SILVER DRAGON CODEX: THE DRAGON CODICES by R.D. Henham. "Jace, a high-wire acrobat in a traveling circus, thought he knew the thrill of adventure. But when he meets Belen, a strange girl with no memory of her past, he soon discovers how much more adventure--and danger--awaits him. Not long after Belen joins the circus, a wizard arrives and stops the show--not by magic, but by accusation. Belen is not human, he says: she is a shapeshifting dragon, who destroyed a nearby town. As Jace and Belen set off in a race against time to clear Belen's name and recover her memory, mysterious forces conspire to throw them off track. Can Jace learn to fly through the air with the greatest of ease--on the back of a dragon--before time runs out?" THE WYRM KING: BEYOND THE SPIDERWICK CHRONICLES by Tony DiTerlizzi. "In the final installment of Beyond the Spiderwick Chronicles, Nick and Laurie had thought they solved their giant problems when they drove all the giants into the sea. But now, the Grace kids have come back to tell them they may have more trouble coming their way! It turns out the giants control the population of Hydra, a dragon like creature that is creating sinkholes all over Florida. But with the mermaids refusing to return the giants to the shore, the nixie's still missing and the threat of a destroyed Florida drawing closer, the kids have to take matters in their own hands." THE ASK AND THE ANSWER: CHAOS WALKING by Patrick Ness. "Reaching the end of their tense and desperate flight in THE KNIFE OF NEVER LETTING GO, Todd and Viola did not find healing and hope in Haven. They found instead their worst enemy, Mayor Prentiss, waiting to welcome them to New Prentisstown. There they are forced into separate lives: Todd to prison, and Viola to a house of healing where her wounds are treated. Soon Viola is swept into the ruthless activities of the Answer, aimed at overthrowing the tyrannical government. Todd, meanwhile, faces impossible choices when forced to join the mayor’s oppressive new regime. In alternating narratives — Todd’s gritty and volatile; Viola’s calmer but equally stubborn — the two struggle to reconcile their own dubious actions with their deepest beliefs. CRASHED by Robin Wasserman. "Lia no longer believes in before. Six months after the crash that killed her, six months after being reborn, Lia has finally accepted her new reality. She is a machine, a mech, and she belongs with her own kind. It’s a wild, carefree life, without rules and without fear. Because there’s nothing to fear when you have nothing left to lose. But when a voice from her past cries out for revenge, everything changes. Lia is forced to choose between her old life and her new one. Between humans and mechs. Between sacrificing the girl she used to be and saving the boy she used to love." DARK VISIONS: THE STRANGE POWER, THE POSSESSED, THE PASSION by L.J. Smith. "Kaitlyn Fairchild has always felt like an outsider in her small hometown. Her haunting eyes and prophetic drawings have earned her a reputation as a witch. But Kait's not a witch: She's a psychic. Tired of being shunned, Kait accepts an invitation to attend the Zetes Institute, where she can have a fresh start and study with other psychic teens. Learning to hone her abilities with four other gifted students, Kait discovers the intensity of her power -- and the joy of having true friends. But those friendships quickly become complicated when Kait finds herself torn between two irresistible guys. Rob is kind and athletic, and heals people with his good energy. Gabriel is aggressive and mysterious, a telepath concealing his true nature as a psychic vampire, feeding off of others' life energy. Together, Rob and Gabriel's opposing forces threaten the group's stability.Then one of the experiments traps the five teens in a psychic link. A link that threatens their sanity and their lives." THE FATAL CHILD by John Dickinson. Third in a trilogy. "Atti is the Fatal Child. Beautiful and adored, she is troubled by a recurring nightmare of violence and betrayal. She can love no one and trust no one, and she wakes screaming in the night. Driven by his love for Atti, Ambrose, son of Phaedra, gives up his wandering existence and takes the throne. This is the story of his kingship and his attempts to remove the curse of Beyah, the weeping goddess, from his land. For while Beyah weeps, she poisons hearts, and only when the weeping stops can peace be restored to the kingdom." THE GOLDSMITH'S DAUGHTER by Tanya Landman. Possibly not fantasy, per se, but of interest. "In the golden city of Tenochtitlán, the people live in awe of Emperor Montezuma and in fear of blood-hungry gods. Under an ill-fated sky, a girl is born, facing a life of submission and domestic drudgery. But Itacate has a secret passion for goldwork, forbidden to women, and is forced to disguise her identity to protect herself and her family. When her city is shaken by Cortez’s invasion, Itacate challenges fate, culture, and faith by crafting golden statues — and pursuing the love of a man who should be her enemy." THE GUIDANCE: GHOST HUNTRESS by Marley Gibson. "Kendall and her ghost hunting team is [sic] the talk of Radisson, Georgia, but one person isn’t so pleased. Courtney Langdon doesn’t appreciate Kendall’s new popularity or her relationship with Jason, Courtney’s ex. So Courtney begins dabbling in the paranormal world. At first it’s all a game to draw attention away from Kendall. But Courtney doesn’t know what she’s getting into—or what wants in her. This is one game that’s about to turn deadly serious." STEALING DEATH by Janet Lee Carey. "When fire steals his family from him, Kipp is left with only his little sister to protect as best he can, and he’s determined that death will not come to her–or to the girl he loves but can never approach. But who would dare to master death? As Kipp finds out, it’s complicated, and possession of the soul sack is no guarantee of success. Dragon’s Keep author Janet Lee Carey has crafted a stirring and original fantasy set in a harsh and beautiful desert landscape, in which a young man who has lost everything finds the strength within himself to care for those he loves–and to allow those he cannot keep close to him to take a path he cannot follow." WINTER'S CHILD: ONCE UPON A TIME by Cameron Dokey. "Free-spirited Grace and serious Kai are the best of friends. They grew up together listening to magical tales spun by Kai's grandmother and sharing in each other's secrets. But when they turn sixteen and Kai declares his love for Grace, everything changes. Grace yearns for freedom and slowly begins to push Kai -- and their friendship -- away.Dejected Kai dreams of a dazzling Snow Queen, who entices him to leave home and wander to faraway lands. When Grace discovers Kai is gone, she learns how much she has lost and sets out on a mystical journey to find Kai...and discover herself." William (who is 8) and I began reading HP this summer. We moved through 1 and 2 very quickly. In book 3 he got frightened of the dementors early on, so we stopped. Since then he's been looking for more fantasy. The Andrew North book sounds like one he would love, so we'll give it a try. I suggest you check out the Wingfeather Saga by Andrew Peterson, middle grade (though it is for all ages, like HP and Narnia) Christian fantasy put out by WaterBrook. The second book North! Or Be Eaten just released in August. The first in the series is On the Edge of the Dark Sea of Darkness. Thanks for the shout-out, Charlotte! And I love your lists--they always get me scrambling to the bookstore and the library. You are very welcome, Tricia and Kate! Tricia--you could well do worse than to try him on This Side of Magic and The Other Side of Magic. Ben devoured them. Kate--my lists do the same thing to me. It startles me every time that there are so many books being written that I want to read! I started the Wingfeather Saga and found it both entertaining and laugh-out-loud funny in parts. So Cameron Dokey has moved on to fantasy books now. I lost track of her back when she was still doing historical romance like The Hearts and Dreams series. Neat. I'll have to check this new one out.